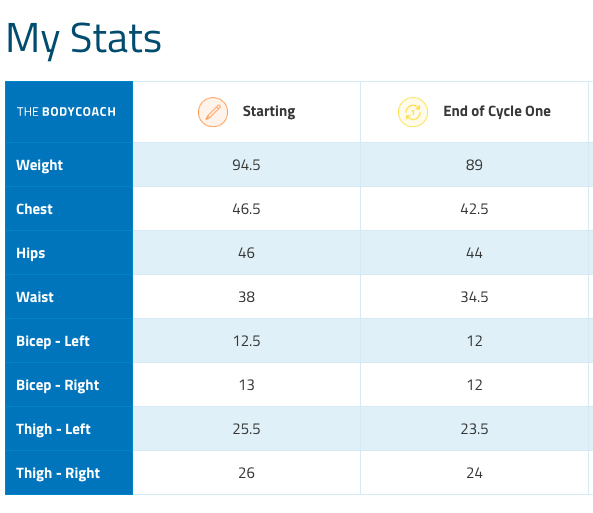 I have now completed Cycle one of The Body Coach 90 Day SSS plan. Hurrah! It has been quite an awakening for me in terms of what a healthy lifestyle and diet should look like! As I have said before, my weight and health had reached a breaking point at the beginning of this year, I was large, stressed, emotionally down and never had the energy to do anything. If you want to read more details on my motivation for starting the plan and my first impressions, click here! I have completed a full 5 weeks of cycle 1 (more on that later!) and I have to say that overall I feel fantastic! I have more energy than ever before. I am not as stressed at work. I cook all my own meals from ingredients and have not heard the ‘pop pop pop’ noise of ready-meal plastic being stabbed in preparation to be microwaved in over a month! Both Dave and I have enjoyed the recipes from Cycle One sooo much. They are delicious and (very importantly) quick to prepare. We have eaten so many things that have previously been way out of my cooking comfort zone. Our favorite has been the Teriyaki Salmon with Courgette spaghetti. I have been doubling the recipes, so cooking for two has been no problem. The smoothie recipes are lovely and super filling (all the food was huge portions actually), perfect for the weekends when I didn’t want to be cooking three meals a day. The recipe selection included several that could be easily pre-prepared and transported. I very much enjoyed batch making the Joe’s Granola; knowing that work-lunch was sorted for the next week and a half. There were a few misses among the hits. The Salmon Fishcakes were… not great. This is not to say the recipe isn’t good. I just think I just forgot my hatred for tinned fish of any kind in a frenzy of kitchen experimentation! Our tinned salmon also had loads of little round fish bones (I think the vertebrae/spine discs) which instantly turned my stomach and put me off opening another tin of fish for a long time. FYI…Turkey bacon is weird. Chicken sausages are not. 5x weekly HIIT sessions was certainly a shock to the system. Prior to starting the plan I had got my morning routine down to an exact science. I could get out of bed, washed, makeup-ed and dressed in a smooth 20 minutes. 15 if i pushed it! Exercising in the morning made my wakeup call shift from 07:45 to an eye watering 06:00! Exercising in the morning raises your metabolism for the day, therefore could be more effective for burning fat and, ultimately net you more weight loss. It was HOT AS BALLS during cycle one. I’m sorry to put it so bluntly, but it was. Exercising in the morning got me done and dusted before the heat really set in for the day. I was already sweating enough without worrying about external factors! The post workout meal was amazing! I loves me a bagel. especially one that contains meat, fried egg and bbq sauce! Exercising after a loooong day at work was never going to happen. At least if I did it in the morning I could get on with my life. I think that last point may be an integral part of my success on this cycle. I was very realistic about what I could and couldn’t do. I exercised early so I didn’t skip it later in the day. I pre-prepared granola for my work lunches as I knew I would fail at meal prep and end up buying lunch. And I didn’t ever give in to a single ‘treat’ or ‘one-off’ biscuit until the last week of the cycle. Pair this with the amazing energy, super clear skin from all the water and the slightly baggy clothes… yep… worth it! I have also had a checkup at the doctors since completing the cycle, and an existing high blood pressure problem has all but disappeared! I am incredibly impressed with both the plan and myself for these accomplishments. So do I have anything bad to say about the 90 day SSS plan? Well, yes actually. I have found the 90 day SSS plan to be a huge drain on the bank balance. Some of the foods cost a lot of money, and shopping seems like a constant task. I need to do many more shop runs a week now to keep up with our demand for fresh veggies. I feel like Sainsbury’s is my second home! Also, the exercise, though effective, is not explained as well as I feel it could be. The youtube video that I followed was a great little routine, however, unlike other exercise videos and classes I have used in the past, it does not go into much detail about correct postures, which muscles you should use for certain moves etc. For example, had I not already done a squat based workout DVD in the past, I doubt I would have performed the squat jumps correctly (sitting back into the squat instead of the natural urge to balance forward). I think that this lack of detailed instruction may have lead to the week where I had to switch to a low impact version of the routine due to a very painful left leg and foot. I asked my Online coach what I should do and they said to just have a pause and resume the plan a week later. Such a great service and it definitely put my mind at ease. High blood pressure status – Gone! Online coach very usefull and convenient. You won’t be able to stop taling about this plan! Stay tuned for my End of Cycle two roundup! New beginnings with the Body Coach ’90 Day SSS Plan’ – Getting started AND what I wish I knew before!